One Word Photo Challenge (Pick Your Own) Avalanche!!!! September 14, 2007,at 4:25 a.m., a tremendous long rolling peal of thunder awakens me. I see no lightning, and immediately have visions of two nights ago, when a long stampede of boulders the size of refrigerators and cars had crashed down the mountain I live on from far above, their progress oiled by two water spouts which had picked up water from the lake and then lifted to the mountainside above to release torrents of water over the already rain-soaked mountains. 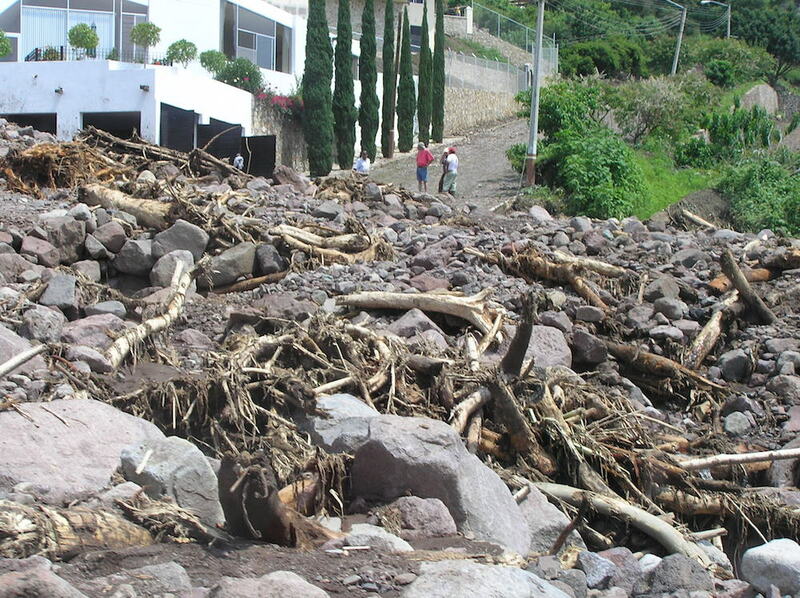 Gathering momentum, this raging river of water tore through two arroyos that run a block on either side of my house, ripping up trees in their paths, they ground up roots and bark into tangles of fiber which mixed with the mud. They shot through culverts, bursting them like boils, took cobblestones down with them, carved new super riverbeds out of former roads, exposed water pipes, ripped stone walls apart to join the mass of water and stone, left giant walls of piled boulders ten and fifteen feet high in their wake. Boulders the size of refrigerators and cars and bulldozers broke through the garden wall of a house two houses away from me and pushed a car through the bedroom wall. A sea of mud and water followed it, shoving all the furniture against the back wall, breaking glass doors and windows to flood out into the backyard. 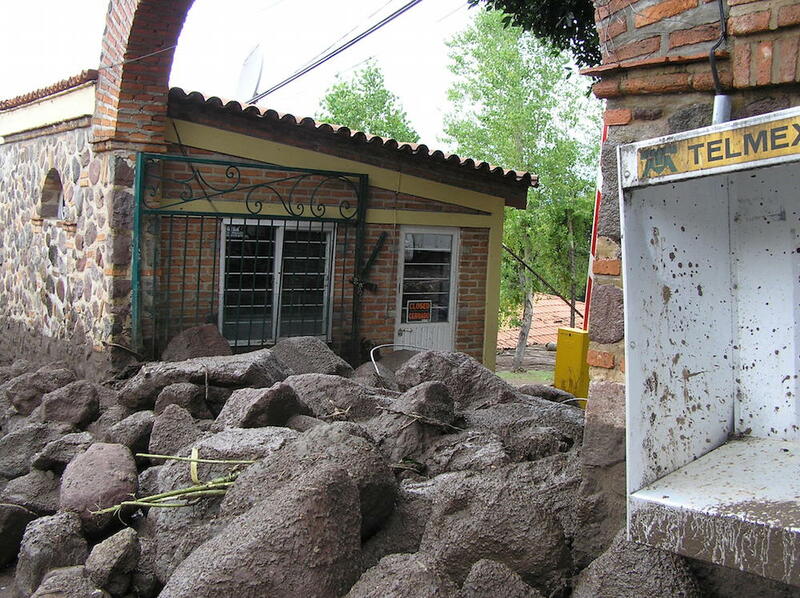 Another boulder took out half of the house and crashed through the neighbor’s wall, then curved to take out two giant metal gates. A colossal grandmother tree from across the street, uprooted by the force of stone and water, snagged between the broken wall and one remaining support from the gate. Below, more boulders are deposited beside either side of the road.. The guard kiosks and gates are swept away. From above, the road as far as I have been able to see it, looks like a river bed piled with boulders, its banks littered with broken houses, uprooted cement electrical poles, half buried cars and bent metal doors, downed street lights and water pipes. All of this had occurred during a 15 minute period, from 6 to 6:15 a.m. just two mornings before. It was still dark when inhabitants of the Raquet Club had been awakened by the noise. Some described it as a freight train, others as a jet flying low above. To me, it was like fifteen minutes of thunder, on all sides, accompanied by rain but no lightening. At first light, I heard a loud banging on my gate. I opened it to a neighbor. Wet to the skin beneath a black garbage sack he’d ripped neck and arm holes in, he directed me out into the street, in spite of the driving rain. “Judy, don’t faint, but come see. Come see that the Raquet Club will never be the same. Now don’t panic, but come see what has happened.” When we rounded the corner, I looked down a street that was a river of mud, knee-high. At the other end of the block, high boulders obscured the view, but I could see water shooting above the boulders. The mud was too high to proceed far, but after I’d gone in to get my high rubber boots, I could wade far enough down the block to see that the gates and the little park and tree on the corner to the left were all gone, had been gouged out like the road to form a wide river of churning mud and boulders. I searched for my neighbor’s gates in vain. They were gone, along with half of her rented house. Later, I was to learn that the 86 year old woman who owned the house had died in Guadalajara two weeks before, struck by a car while crossing the street. For the six years I’d lived here, she had been catching the bus from Guadalajara to come collect the rent, walking the ¾ of a mile up the steep mountainside to collect the rent or to harangue the gardener. I was glad she had been spared the spectacle of her house broken in two. Countless people had tried to buy it, at least before the megalithic house had been built below it, blocking its view. Now it was only her heirs who would regret her decision not to sell. Later in the day, most roads outside of a square block or two blocked, my neighbors and I trudged around the Raquet Club to see the further devastation. 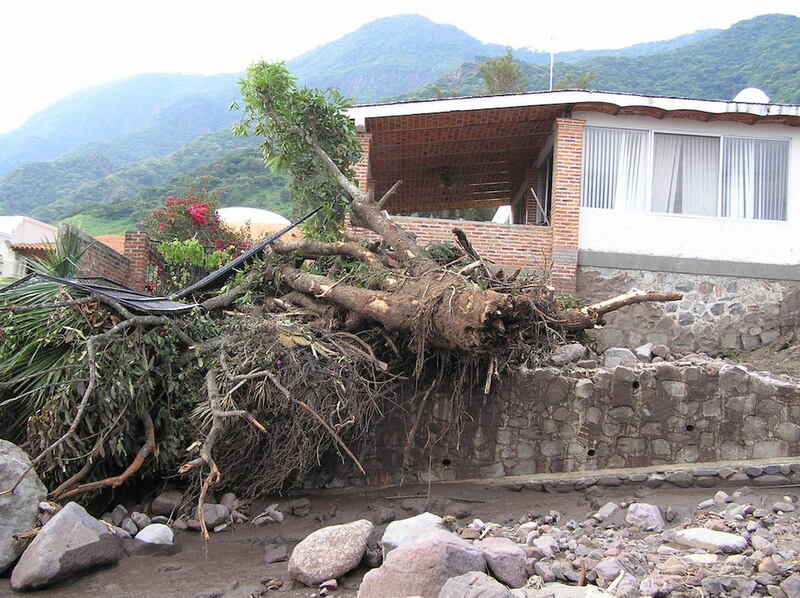 One house was swept away into the arroyo to the west of me. 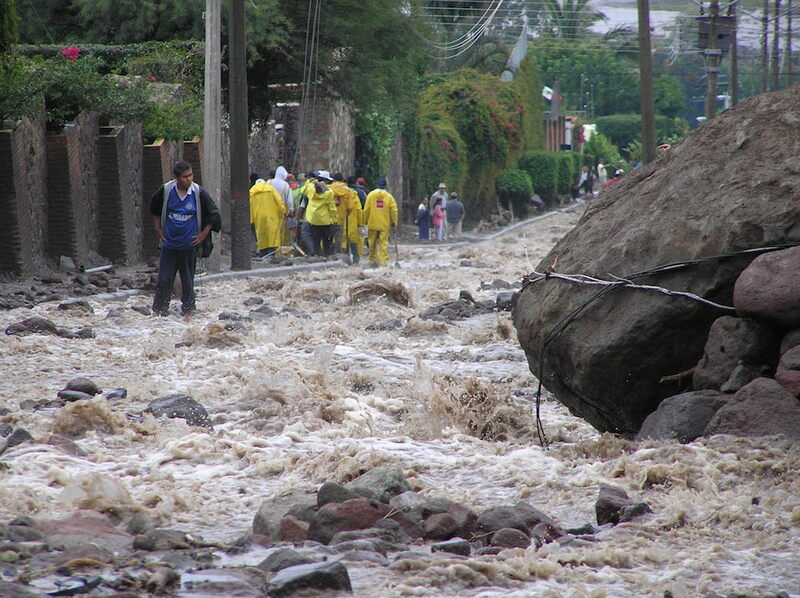 This arroyo had also undermined other houses, whose inhabitants were being evacuated. It had also picked away like a scab a huge retaining wall filled with fill that ran along the western size of the arroyo. The wall, five feet thick and an entire lot long, had luckily not yet been built upon. 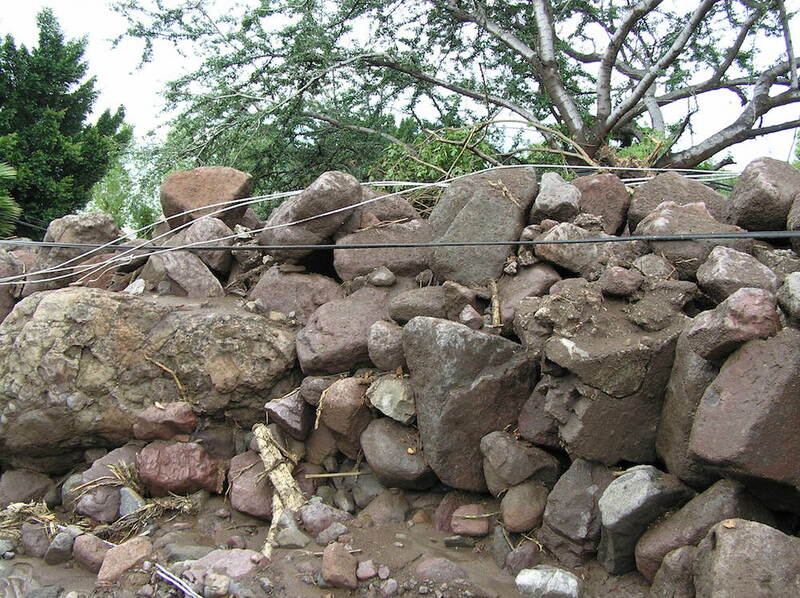 Wall and fill were now gone–tumbled down the mountainside. Further below in the pueblo of San Juan Cosala, rivers of mud blanketed the carretera. 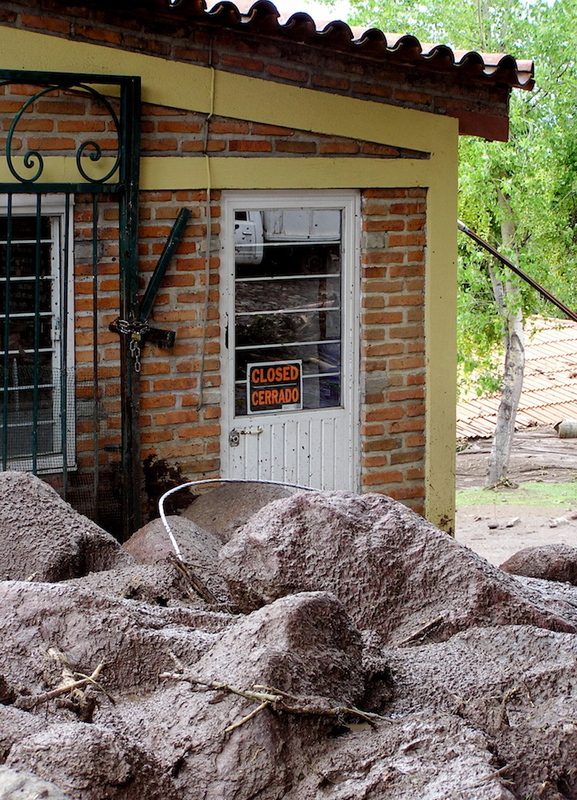 Boulders plunged through houses, leaving gaping holes. Two days later, the paved road looked like a dirt road as villagers all arrived with shovels to try to dig out the road. Announcements had been made in Jocotepec and other nearby villages and countless citizens could be seen walking down the road, shovels in hand. Trucks arrived carrying clothes donations and blankets. 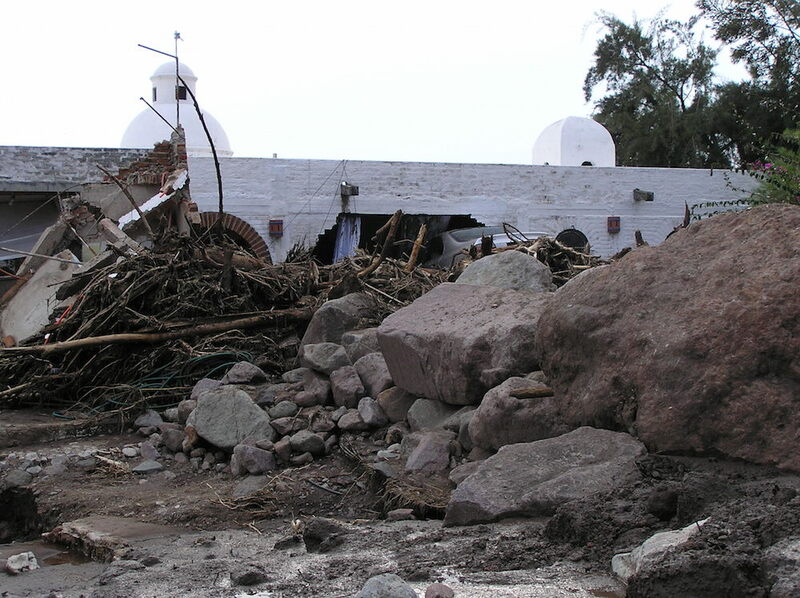 Roads to Ajijic were closed due to heavy equipment movement, but within 24 hours, graders and bulldozers had been brought in to move the giant boulders blocking the road above the service entrance of the Raquet Club and within 24 hours, it was possible to ford the river that now blocked the road and to drive down the boulder strewn streets out of the back entrance to the Raquet Club. As we drove in my friend’s pickup, we could see the lake clearly from the careterra. The lake that six years ago was a quarter mile distant from the town now lapped against her skirts. After so many years praying for rain and a full lake, people were now praying for it to cease. Now, at 6:20 A.M., 48 hours after the deluge, rain again pounds on my roof. Surveillance trucks drive by my house every 15 minutes or so, patrolling the few streets they have access to in search of problems or looters or those in need of aid. A block away, two cars lie under piles of stone. The inhabitants who owned them exited their house through second story terraces and windows, the entrance to their house sealed like a tomb with giant rocks. The first day after the avalanche, hard-hatted emergency workers wandered the streets like lost children, clean shovels in hand. As my two female friends and I shoveled mud and water, trying to open a channel to the vast lake of knee-high mud in our street, they stopped to ask us if we were all right. One asked, “Do you speak Spanish?” When I answered, “Si, poquito,'” he exclaimed, “Thank God!” and lapsed into a flood of Spanish. I take it he had been wandering around all day talking to Gringos who didn’t understand what he was saying. I understood about one third of what he was saying to me. When I asked him to help us, he said that machines would come to do that later and he walked on. Hours later, he and his group came by walking in the other direction, their shovels still pristine. 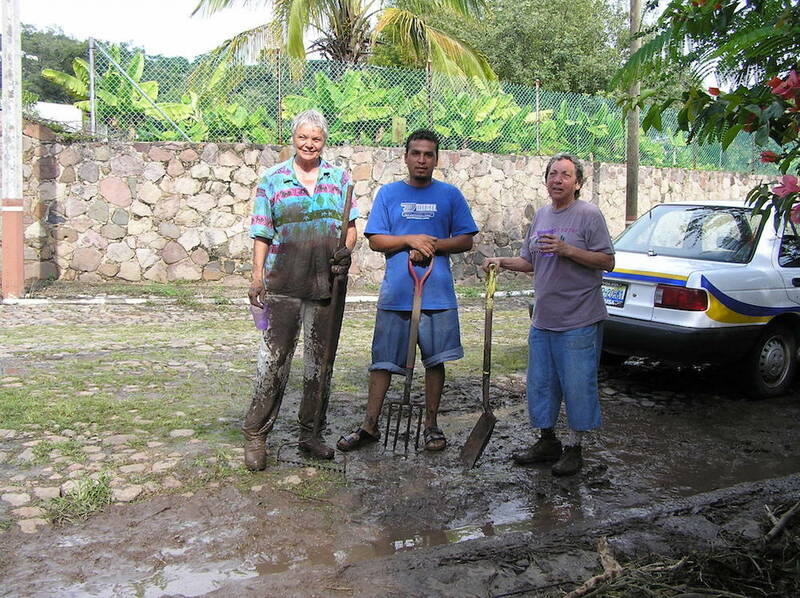 That entire day, the only people I saw working to clear anything were my two female neighbors and me, and then the Mexican man house-sitting next door, who came to wield the wheelbarrow that we were using to remove mud and tree roots to an adjoining lot. 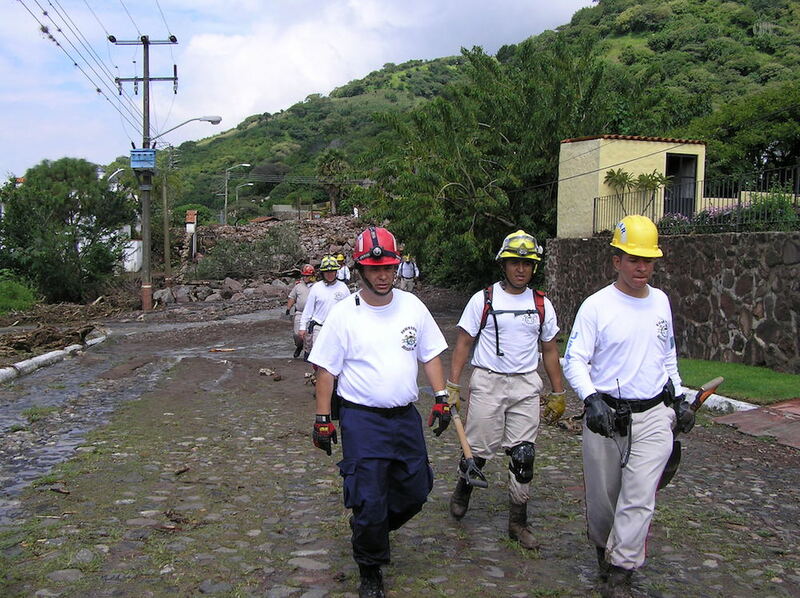 The next day was filled with emergency workers and firemen from Guadalajara, Zapopan, Morelia and other towns even more distant. Helicopters circled overhead, examining the dangers of even more rocks and mud balanced above, ready to roll down the same arroyos. Residents were evacuated. Bulldozers gouged a hole into the stone barrier that separated our street from the new river that has replaced our downward sloping street, and the lake of mud started to flow into the river, lowering the mud level to only ankle high. Looky-loos arrived from down below, climbing up the long mile or so of road to our level, where the worst devastation seems to have occurred. Oblivious to people climbing up from below, bulldozer operators opened up channels so streams of mud and water trickled down from above. Although the cars of anyone but residents were being blocked from entering the San Juan Cosala and Raquet Club area, no one seemed to be barring foot traffic from entering the work zones. Then, with no warning, a new stream of mud shot out from a break in a wall that lay below an area being cleared out by bulldozers, I jumped out of the way. At this time, as all other times in Mexico, people were expected to watch out for themselves. Neighbors adjacent to the arroyo and the street which is now an arroyo have told me of being awakened two mornings ago by a gigantic rumbling and shaking of their house. Standing in the dark on their balcony above the street, they heard and caught images by flashlight of boulders tumbling down and tearing up the street. 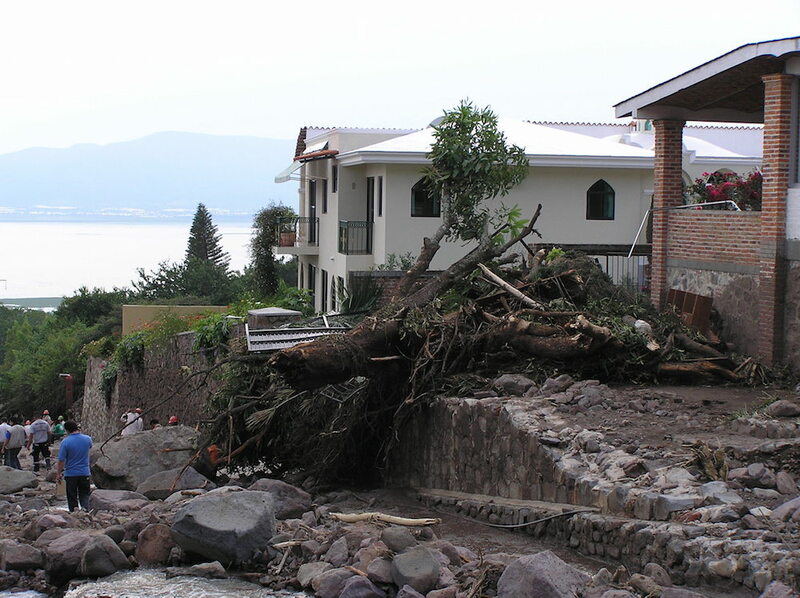 They heard their neighbor’s house demolished by the boulder which then broke through their own wall and rolled toward the wall of the house below the balcony they were standing on. Luckily, it deflected off another boulder and rolled to the left to crash through their gates instead. Looking by flashlight across the road, they imagined their neighbors’ houses to be gone, but later discovered by the light of day that they were instead hidden from view by a wall of giant boulders that had replaced their former stone walls. For me, a block away from the devastation on each side of me, the entire experience of the avalanche was one of sound. A complete silence, then a solid thunderous drumming that I took to be rain on all the rooftops around me, or lightening-free thunder…solid and uninterrupted for 15 minutes. A friend a few blocks below me talks of hurricane force winds, but above, it was deadly silent except for the rain. I think perhaps she experienced the tornado down below which had siphoned water from the lake before lifting above my house to release the water in the mountains above. I have been told that a local newspaper reported that there were twin waterspouts. I had heard these tornadoes which sucked up water from the lake were a yearly occurrence up until six years ago, when I moved here. One had caused massive slides in El Limon. Another old-timer tells us that a mud and rock slide of this dimension hadn’t happened above San Juan Cosala in the area where the Raquet Club now exists for two hundred years. For the two days after the event, occasional clusters of inhabitants walk down the mountainside, picking their way over boulders and through mud, suitcases in hand. Some are being evacuated. Others have decided their vacation homes are no vacation at all without electricity, phones or Internet, not to mention roads. By 9 o’clock p.m., the second day after the disaster, I am sitting at my neighbor’s table sharing a stone soup comprised of the contents of our cumulative rapidly-thawing freezers. Suddenly, the lights flicker on. We can’t believe it! With half the poles down, they have reinstated the electricity in less than 48 hours! This is efficiency beyond our dreams. I return to my own house to find electricity but no water. The switch on my water pump seems to have burned out, since it probably ran without ceasing while pumping no water. I again don my waders and slosh through sucking ankle-high mud to close the doors of my absent neighbor’s refrigerator, which I have hours before emptied of its soggy contents, leaving the doors open. Since I have forgotten to unplug it, it now churns cold air out into the kitchen, it’s sad remnants of pickle jars dripping the sweat of water unable to refreeze in this exposed condition. Now, at exactly 48 hours after the main event, all is calm. No wind, rain or thunder. Within an hour or two, it will begin to get light and I’ll go out to see what all the fuss was about. Was it really thunder or has the threatening wall of mud and stone above finally released? I hope this long climax of waiting is finally over so we can get back to the clearing up. There will be a long year of reconstruction, further assessments to property owners, meetings, arguments, and cooperation between neighbors. Hopefully, those evacuated will be restored to us. Hopefully, lost houses are fully insured. It would be wonderful if the clubhouse and pool, now filled with mud, were insured, but I doubt it. Selfishly, I am relieved that my own house, fully insured, is untouched. Down below in the pueblo, the church bells toll. I hope it is calling the people to an early mass instead of announcing a death. There have been various reports of dead and missing: From 2 people to 125 people to no deaths. I hope the latter is true. I hope the village shares my luck in being close to disaster that they have somehow escaped the severest results of. Happily, although a number of people were washed out of their houses and into the lake in the village down below, there were no deaths and only a few injuries reported. It is now eight years since this horrendous occurrence and in that time, no other events of this magnitude have occurred. Perhaps the mountain has flushed it’s debris and it will be another hundred years before it again purges itself, but Proteccion Civil—the Mexican civil defense organization—remembering the excesses of the past, issued a warning just a couple of weeks ago, on the day before Hurricane Patricia was to reach us, that residents of three streets, including mine, should evacuate their houses. As difficult as this was in the pouring rain, with three dogs, I did so. Although it proved to be a false call, my memory of the devastation that had occurred in just 15 minutes a few years before made me not question their call. This entry was posted in articles, Judy Dykstra-Brown photos and tagged Avalanche, disasters, floods, Judy Dykstra-Brown images, landside, One Word Photo Challenge, photos of disasters, Raquet Club, San Juan Cosala, waterspout on November 10, 2015 by lifelessons.